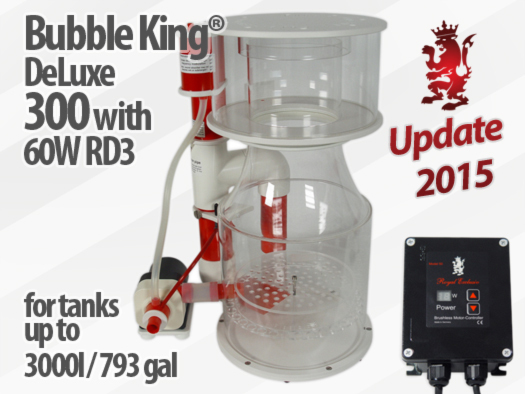 We have facelifted our Bubble King® DeLuxe 300 external skimmer. Check out here! Thank you for 4000 likes on Facebook! 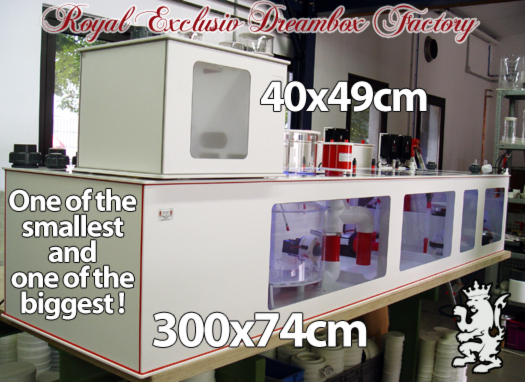 Royal Exclusiv® offers permanently from -10 up to -15% for Dreambox items at Royal Exclusiv USA shop. Make your own deal and order now. 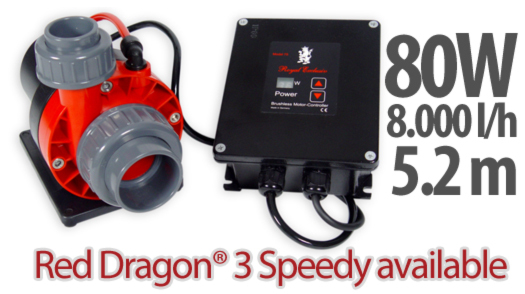 Royal Exclusiv® present the Red Dragon® 3 Speedy pump 100 Watt FLOW Version at Royal Exclusiv USA shop. 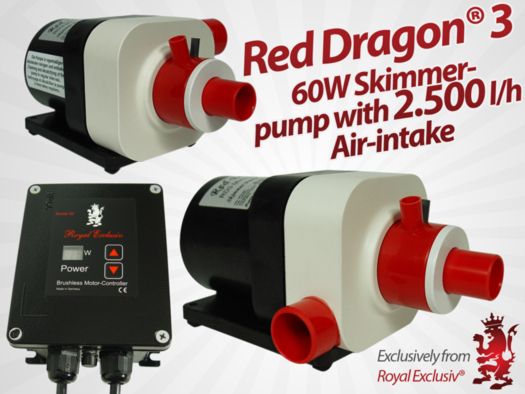 Royal Exclusiv® present the Red Dragon® 3 Speedy pump 100 Watt HIGHPRESSURE Version at Royal Exclusiv USA shop. Royal Exclusiv® at the Interzoo 2018 in Nuremburg, Germany. Join us! 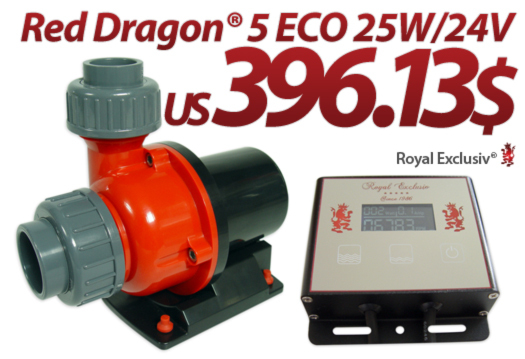 Our new Red Dragon® 5 ECO, brushless DC with 24V! Also this year, we have a booth at the ReefAPalooza in Orlando. Visit us! 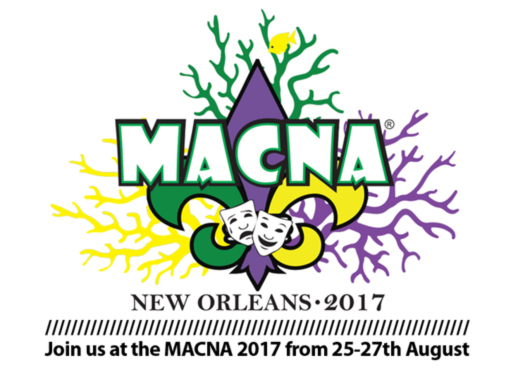 Come and visit us at the MACNA 2017 in New Orleans from 25th till 27th August 2017 and see the Dreambox 3.0 live! 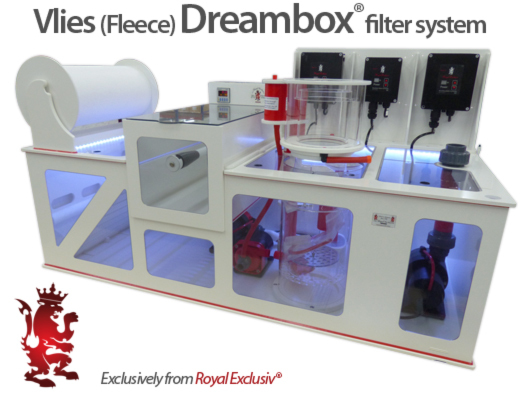 We are really proud to introduce our new Vlies (Fleece)-Dreambox-Filter, after a longterm test- and developing phase. Complete systems in the USA are available, now. Also this year Royal Exclusiv USA at the MACNA 2017 in New Orleans. Here is the Floor Plan. Come and join us from 25th till 27th August 2017! Also this year we are at the Reef-A-Palooza in Orlando, join us. Here is the floorplan. Visit us at the Macna 2016 in San Diego! We thanks our customers for your loyalty and the support on Facebook! 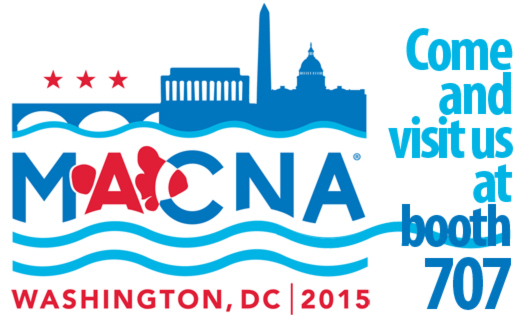 Join us at our booth 707 at the MACNA in Washington DC. September 4-6, 2015. We are very proud to announce that we have a new member at RE’s US-Team! Scott Leif is an absolute expert in our products and most of all saltwater aquarists will know him from his great activities at “Reef Central”. As the responsible for our West-Coast Depot at Chatsworth, California. Scott will take care for the coming up “Royal Exclusiv” board at “Reef Central” and also for our customer and technical support in the US. 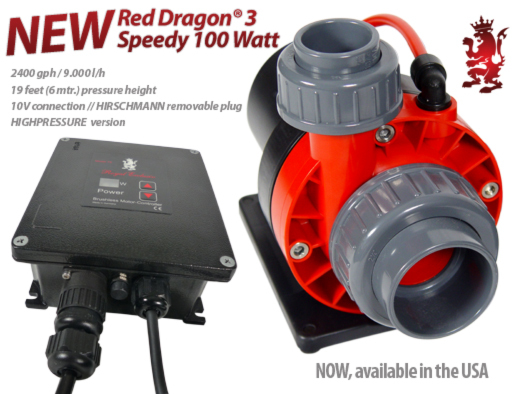 The new Red Dragon® 3 with 230W is available in the US, now. Due to the development of the US-Dollar – Euro exchange rate since summer 2014 we have decided, not to participate on this positive trend for our US-customers. 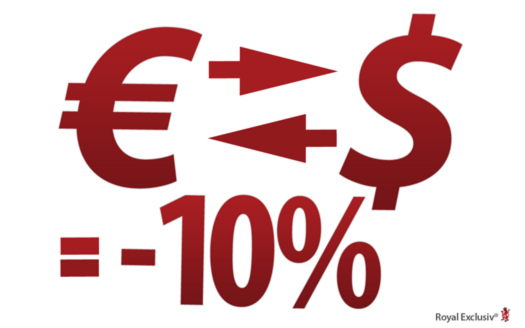 Therefore we reduced the prices in our US-webshop www.royalexclusiv.com by 10%. Meet us at the Reefapaloozashow in Orlando / FL in 2015! 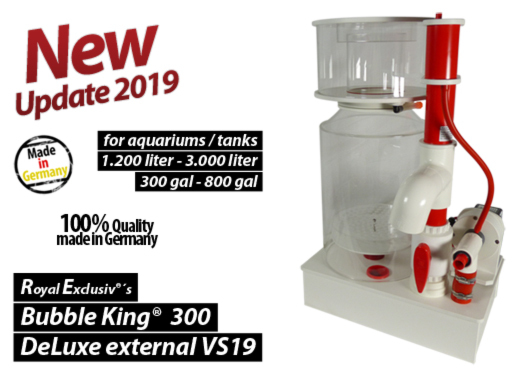 Also a premiere, exclusiv for the USA, the new Bubble King® DeLuxe 300 Version 2015 with the adjustable 60W RD3 skimmer-pump in 110V/60Hz is available right now. 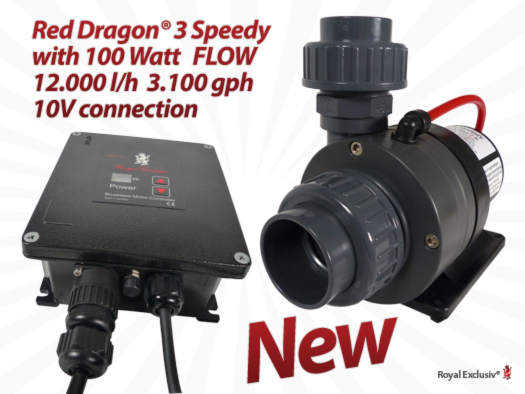 The RD3 with 60W is standard equipped with a 10V connection. 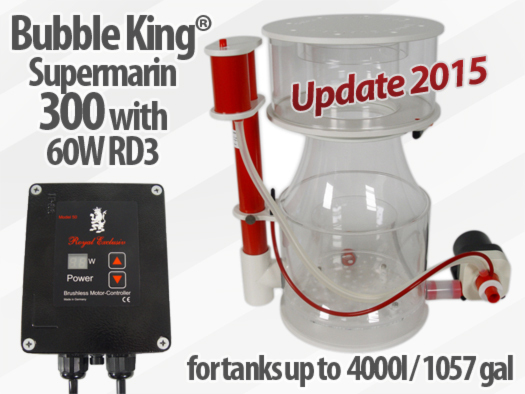 Premiere, exclusiv for the USA, the new Bubble King® SuperMarin 300 Version 2015 with only one adjustable 60W RD3 skimmer-pump in 110V/60Hz is available right now. The RD3 with 60W is standard equipped with a 10V connection. Coming soon. At first available at the US-market. More information will be following. Stay tune! 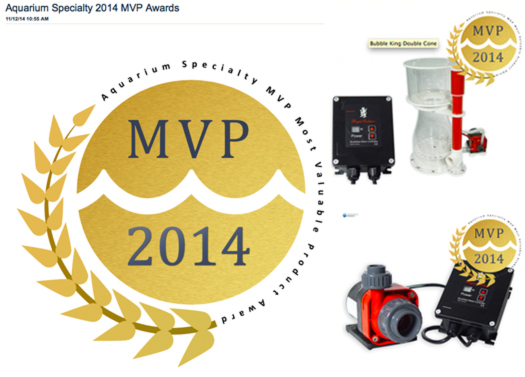 Aquarium Specialty is pleased to announce it's 2nd Annual Most Valuable Product (MVP) Awards. 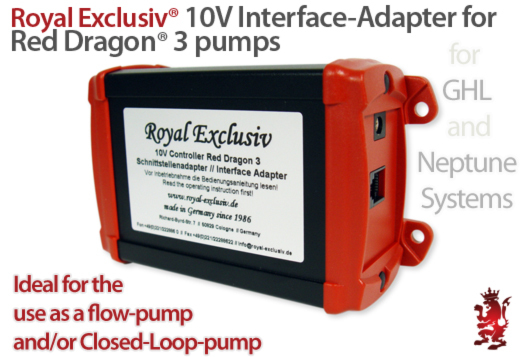 We want to introduce the 10V Interface-adapter. 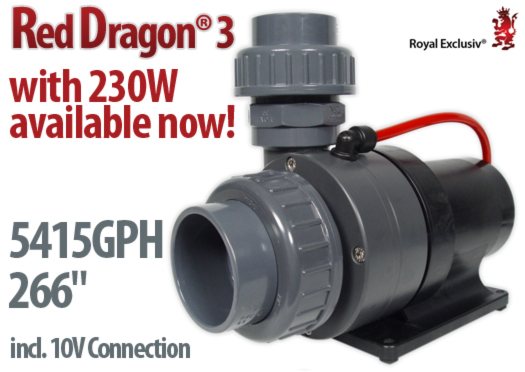 Ideal for the connection of a Red Dragon® 3 on a aquarien-computer i.e. from GHL or Neptune Systems! 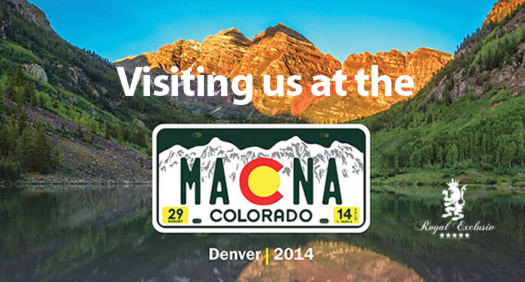 Royal Exclusiv USA at the MACNA in Denver! 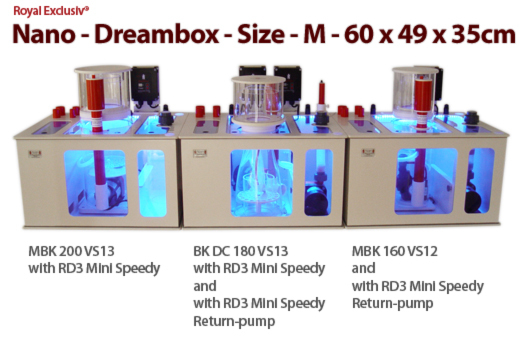 All Dreamboxes are available with red seam welds, now. 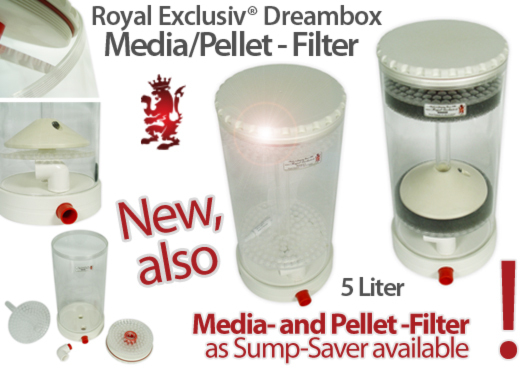 The new 5-Liter model of the Media-filters // Pellet-filters as SumpSaver version is available now! Same, same, but different. 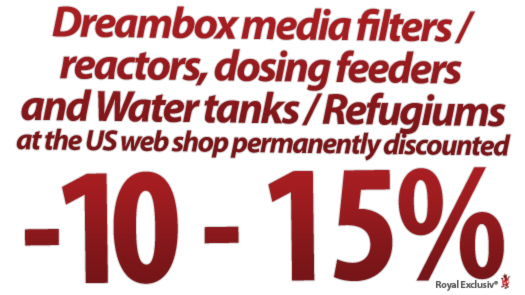 Here is the list of all available sizes Dreamboxes_list.pdf. 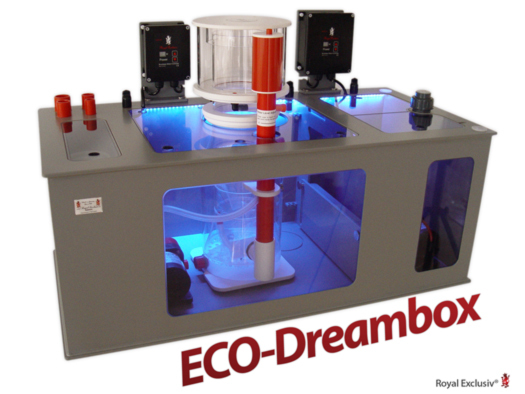 New: The ECO-Dreambox® from Royal Exclusiv®. Here is the ECO Dreamboxes_overview_list.pdf of all available sizes. Now, all newly produced Dreamboxes look somewhat prettier. 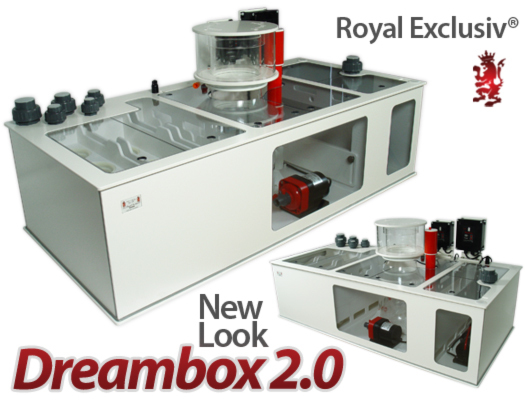 We want to introduce the Royal Exclusiv® Dreambox® 2.0. 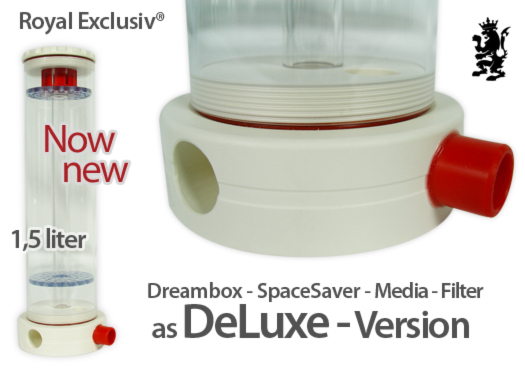 1,5 l Media-filter is now available as a DeLuxe version with fine thread above and below, for a better handling and cleaning. Available as a Media-filter and Pellet-filter. 2Liter-version coming soon! 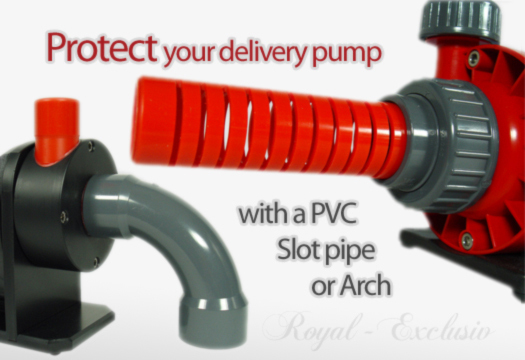 Protect your pump and thus extend the life. 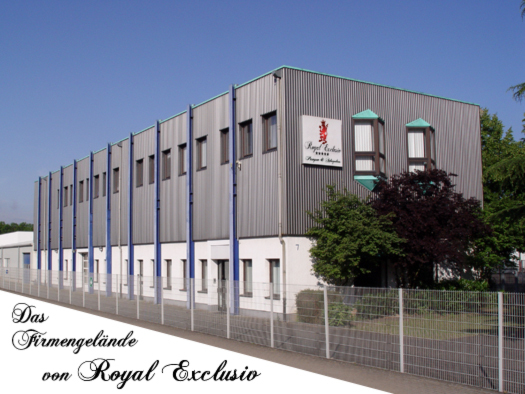 The Royal Exclusiv ® company is headquartered in the north of Cologne and specialises in the production of pumps, protein skimmers and high-quality filter plants for aquaria. It all started in 1986 with the production of exclusive and high-quality complete systems. The workshop is backed by over 25 years of experience in fresh and salt water aquaria construction. 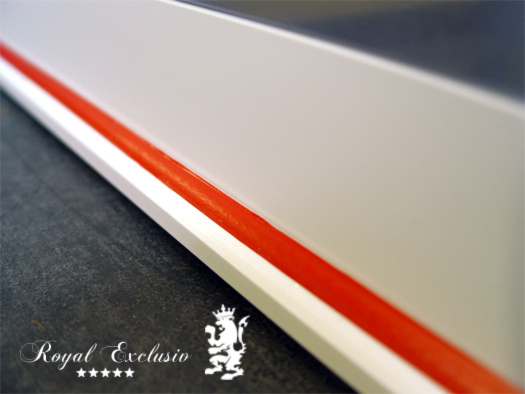 Royal Exclusiv® produces premium products of the highest quality. 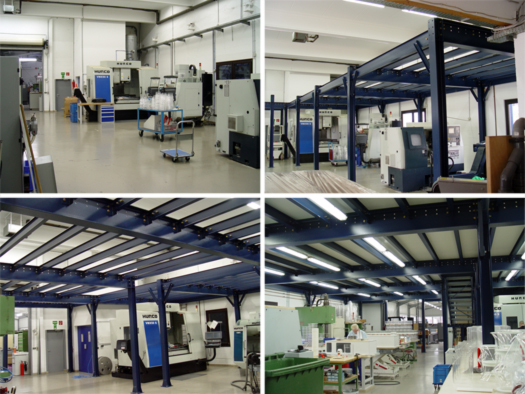 Long-term testing and inspection phases in the inhouse lab are carried out prior to production. These quality standards have turned Royal Exclusiv® into what it is today. 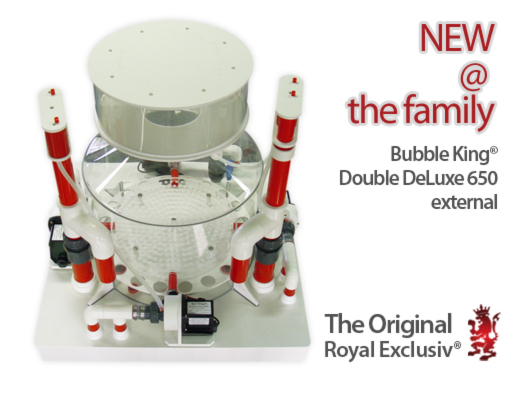 For more information on Royal Exclusiv® please click here.